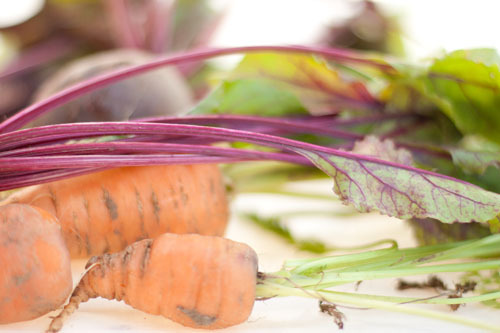 Home » Why are you a vegetarian? Why are you a vegetarian? I get asked this question a lot. My short answer to this has always been that I went vegetarian in order to save the world. And, I add a little joke now and say that my husband says I’m a vegetarian just to be a pain in the neck. I really do love fresh veggies. So colorful, full of flavor, and all those different textures. Yum! But, honestly, it was in order to help save the world* (I’ll go into the nitty gritty of this idea later in the post so that you can read the story part without the “save the world” part if you want). Now we call it reducing our carbon footprint or going greener. Those terms weren’t around for me to use back in the day. Going vegetarian just made sense to me. It still makes sense. And, in fact it makes more sense to more and more people as time goes on and more people become vegetarian, vegan, or flexitarian. You’ve probably heard of Meatless Mondays. I think this is a great way to start – you get some healthy veggies, you get used to the idea of eating without meat. I remember having someone over for dinner many years ago, and about an hour after dinner she turned to me and said, “hey, there wasn’t any meat in that!” She was surprised that she didn’t even miss the meat. If I go back to my beginnings as a vegetarian… I was 17 years old and I told my mom that I wanted to be vegetarian. She told me that if I really wanted to do this, I would have to do some reading and some research to find out if it was healthy. Then, if it was a healthy thing to do, I could become veg when I turned 18. So, I went researching (something I still do to this day, maybe mom instilled that in me!). I found out that a healthy vegetarian diet could provide all the vitamins, minerals, and protein that a person needs. The only thing that’s hard to get from the diet is vitamin B12, but that comes in fortified cereals and vitamins, so your body actually won’t be lacking in that if you’re careful. I made my case to my mom, and proved that it was healthy. And, when I turned 18, I turned veg as well. That’s some of where my love of cooking comes from. Mom and I learned together how to cook veg. We read magazines and looked at recipes. We cooked together. Before I turned veg, we ate meat in the house. 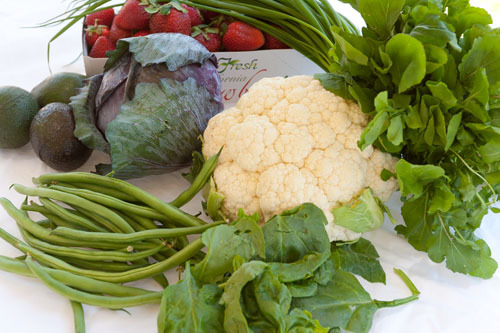 These fruits and veggies are straight from the farmer’s market. I love the variety and freshness you can get there. I ate a lot of meat. I loved pretty much any kind of meat. I liked liver, steak, turkey, chicken. My favorite thing at KFC was the extra crispy chicken skin. Yep, that’s it, the skin. EEEEW! My husband likes to say that there’s only so much meat a person can eat in their lifetime, and I’ve actually already met my allotment. So, I had to turn vegetarian. One of the questions many people have about vegetarianism is about getting enough protein. Please don’t fret, dear friends. It’s very easy to get enough protein in the diet. In fact, many people take in excess amounts of protein, and excess protein has been linked with osteoporosis, kidney disease, calcium stones in the urinary tract, and some cancers. 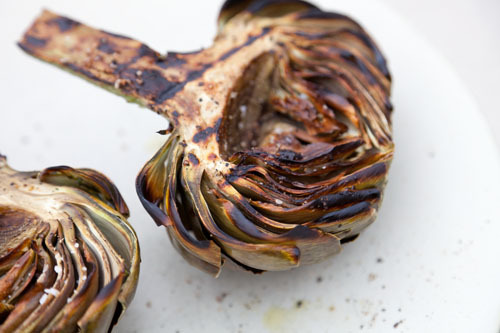 grilled artichokes are a yummy treat. Check out my how to cook and eat an artichoke. Protein requirements vary based on a person’s weight, but, in general, the RDA for adult men is about 56 grams a day, and for adult women is about 46 grams a day. There are exceptions for pregnant or lactating women (recommended intake rises to 71 grams per day) and body builders. Another way to count protein needs is as a percentage of calories. The USDA’s MyPyramid plan suggests that protein intake is 17% to 21% percent of total calories. The Institute of Medicine recommends at least 10% and no more than 35% of calories from protein. Good vegetarian sources of protein include: dairy, eggs, lentils, beans, quinoa, peanut butter, nuts, wheat bread, spinach, broccoli. 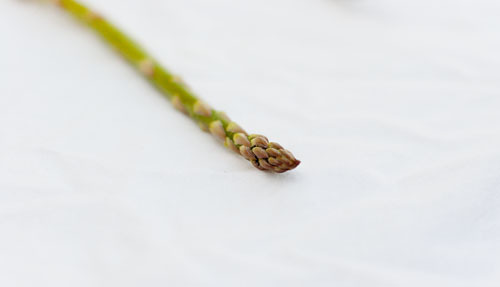 Plants such as beans and nuts are a particularly great choice, since so many people fall short on their fiber intake. Vegetarian sources of protein are generally rich in fiber and plant-based phytochemicals that may help lower heart disease and cancer risk. Plant proteins are classified as incomplete proteins because they don’t typically contain all essential amino acids. Fortunately, your body combines these incomplete proteins in order to obtain all necessary amino acids. According to Vegetarian Times, “it was once thought that various plant foods had to be eaten together to get their full protein value, but current research suggests this is not the case. Many nutrition authorities, including the American Dietetic Association, believe protein needs can easily be met by consuming a variety of plant protein sources over an entire day”. Along with some wonderful experiences, I’ve had some pretty bad experiences being a vegetarian. I went to dinner at someone’s house many many years ago, and she had made a baked casserole with chicken in it. She told me that I could just pick around the chicken. I had to tell her it doesn’t work that way. I ended up eating salad that evening, and being quite embarrassed the whole evening. There was the time that a family member made me cry in a steak dinner restaurant. There was the worker at the amusement park that scowled at us and said, “we have SALAD” in a very harsh tone, and proceeded to be extremely rude to us. But, by far, most people have been very nice, if not outright curious about vegetarianism. Some of the ways I’ve been able to not only make the switch to vegetarianism, but to make it a healthy switch is by reading lots of magazines and cookbooks. I really do like to sit down with a good cookbook and read it, much like a lot of other people like to sit down with a good murder mystery book. Here are some of my favorites: Vegetarian Times magazine, Cooking Light magazine, Vegetarian Cooking for Everyone by Madison, The Enchanted Broccoli Forest by Katzen, and Moosewood Cookbook by Katzen. Through the years, I’ve been asked several times exactly what I eat. Some people think all vegetarians eat is salad. Au contraire, mon frère. The easiest way I found to explain it to most people was that I don’t eat anything with a face. Technically speaking, I was a lacto-ovo vegetarian for many years. That means I ate dairy and eggs. I never thought I could go vegan (not eating anything that comes from animals including eggs, dairy, even honey), because most cookies require eggs, and I don’t really think I could live without cookies. For that matter, ice cream is on my list of must haves! In the past couple years or so, I’ve started eating fish. So, if you want to give it a title, it means I’m a pescatarian. I started eating fish in order to help promote sustainability and stewardship of the oceans. If I can do my little part to bring awareness to helping clean up our oceans, I feel very fulfilled. At this point in my life, I’m not so caught up in official titles – lacto-ovo, pescatarian, etc. Part of what I’ve learned is that it doesn’t really matter. And, the fewer labels you have, the fewer restrictions you put on yourself, the more you can eat what you feel is right. Maybe you find you need to eat meat (my husband falls into this category, if he doesn’t get some meat, he gets a bit grumpy – really). Maybe you decide to eat only grass-fed and humanely slaughtered meat. Maybe you eliminate all red meat, or you do Meatless Mondays. Maybe you decide to go vegan. Maybe you want to try out a raw foods diet. Or, maybe you just decide to add more fresh whole fruits and veggies to your diet and fewer processed things. It’s all good. I’m here, with my blog, to provide fresh ideas of things to try. I have tags for vegan and vegetarian options (though I haven’t finished going back through all the older posts yet). 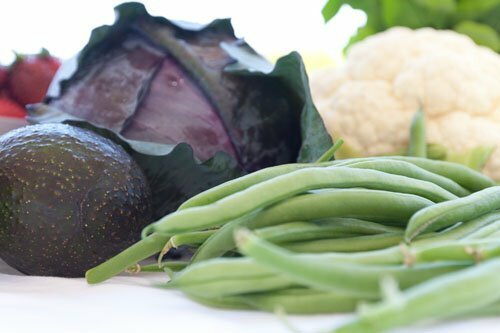 If you want to try adding more veggies to your diet, or you want to try some vegan or vegetarian options, I’m here to help. Or, you can check out my fish recipes if you want to try some sustainable seafood dinners. Hopefully some of the dishes will inspire you. I’ll even post some of the things that didn’t work, maybe those will inspire you as well. Or, at least you’ll get a chuckle out of it. When my husband was a kid, pretty much every meal started off by ground beef being browned in a pan. 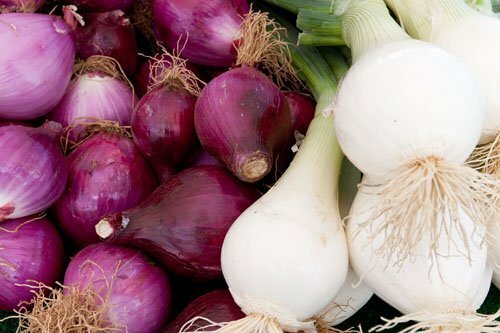 Now, pretty much every meal starts off with onions browning in a pan. *The “save the world” part: The following facts are from Vegetarian Times and The Independent. Going vegan saves 1 ½ tons of co2 eq, compared to the Standard American Diet (SAD). Even if you still eat eggs and dairy, going veg can reduce your carbon footprint by almost a ton annually. You’ll reduce your water footprint, too, because animals and their feed require lots of water. To produce a pound of meat 2,500 gallons of water are needed as opposed to 25 gallons needed to produce a pound of wheat. The amount of grains fed to animals could feed up to 4 billion people. About 70 percent of all grain produced in the United States is fed to animals raised for slaughter. Being veg helps to reduce pollution. According to the US Environmental Protection Agency (EPA), chemical and animal waste runoff from factory farms is responsible for more than 173,000 miles of polluted rivers and streams. Livestock is responsible for 70 per cent of the Amazon deforestation. Vegetarian diets are more healthful than the Standard American Diet (SAD), particularly in preventing, treating or reversing heart disease, lower blood pressure, control diabetes, and reducing the risk of cancer, kidney stones and gallstones are less likely. In addition, vegetarians may also be at lower risk for osteoporosis because they eat little or no animal protein. A high intake of animal protein encourages the loss of calcium from the bones. The SAD is high in saturated fats and processed foods and low in plant-based foods and complex carbohydrates. If you switch from the SAD to a vegetarian diet, you can add about 13 healthy years to your life. 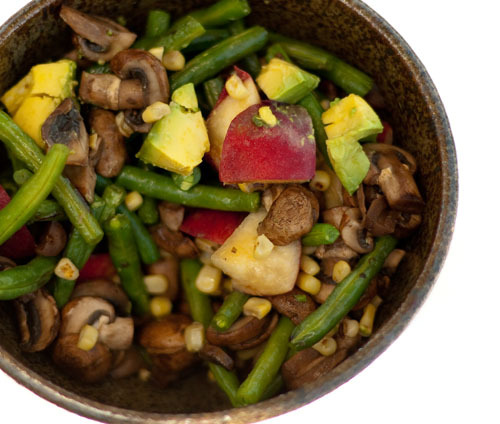 This is my favorite summer meal – chopped peaches, green beans, avocado, corn, and mushrooms. I’m drooling now just looking at it!